Indianapolis investigators need help catching ATM thief. 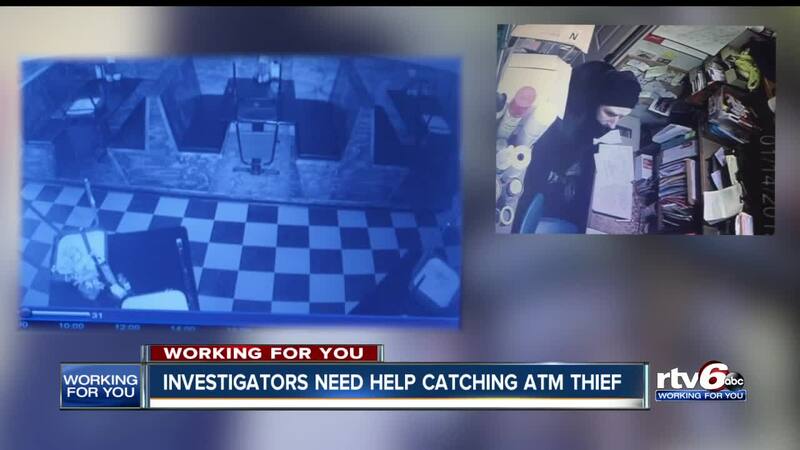 INDIANAPOLIS — Above, a video shows the moment a thief drags an ATM, full of cash, through a business on the southeast side. This has not been the only place hit by a burglar in the area, overnight. Authorities are asking for the public's help in identifying the crook(s) that have been connected to a series of break-ins on this side of the city. "For it to happen just after six o'clock this morning, is a pretty active time for South Eastern Ave.," said Brewskis management. Management says the thief broke in using a rock to smash a window. He didn't get the safe, as it is bolted to the floor. But he did get the pub's ATM — dragging it outside and taking off. The burglar moved it clear across the restaurant, through the bar and out a window all by himself. The police report says the machine had as much as $8,000 inside. It also says that Brewskis is one of at least three bars in this immediate area to be hit by burglars since the weekend. Less than five miles away, on the same morning, Lena's Sugar Shack had two cash drawers stolen. Less than a mile away from Lena's, a burglary at Bonna Station where a thief took off with cash and liquor. If you have information on any of the burglaries on the southeast side — call Crimestoppers at 317-262-TIPS.